New South’s Randall Williams said it well about John Seigenthaler. Randall put it superbly, simply, and originally: “He was a good man who gave white Southerners a good name during our dark period of massive resistance, obstruction, and violence against civil rights.” As any Southerner with a lick of sense and an ounce of perspective would agree, that is a mammoth and most difficult achievement. Thus from a national as well as a regional perspective, Randall’s encapsulation gives high honor to a great person an awful lot of people regard as one of history’s finest. John Seigenthaler was perhaps the most central and admirable personality that defined the Nashville I lived in during the 1970s. He was the apotheosis of integrity and of all that was serious and good. Anybody who knew him, even if they were his political opposites, held him in lofty esteem for the serious, smart, and incredibly intelligent human being he was. Indeed, John’s personal and professional record was well known. He and I were by no means close friends, but we each had close friends who were close friends of us both. To John I was merely a familiar face and a good acquaintance, while he, in the geist and gestalt of that time and place, was a major figure in Nashville’s overall environment, and I was bumbling about in the thick of it there in my thirties and early forties. I lived in Nashville from the summer of 1970 until February of 1981. Like Memphis, Nashville was, in a social sense, a very small community. Everyone knew or knew about everyone else in all the odd and colorful corners of the city’s make-up — its politics, Music Row, Nashville’s huge academic community, downtown’s exceedingly high finance, dinner at Sperry’s Restaurant and late-night parties on Belle Meade Boulevard — it didn’t matter, anyone could be everywhere . . . plus, everyone was connected or outright related, either on purpose or accidentally. I loved it all, and for a long time, life there then was electric. I taught school. I waited tables. I lucked up and landed a momentary part as an on-camera-double for James Hampton, in a Burt Reynolds film, W.W. and The Dixie Dance Kings, and I failed an audition at Opryland. They asked me if I could sing and dance, and I said, “No, but I will.” Yet most of all I learned how to write songs on Music Row, primarily in and around Ray Stevens’ Ahab Music, on Grand Avenue, and later over on 17th as a member of Tree International’s stable of close to ninety or a hundred other writers. Tree was the largest music publishing house in the world, and I think it is now Sony/ATV Music Publishing LLC, or some such, and, I am certain, has very little recollection of my existence. In any case I learned more on Music Row about a writer’s craft in general, by writing lyrics for pop and country songs, than at any other time or in any other place. All the principles involved in putting together a country song are exactly the same principles one applies in writing a short story or a novel. In any case, back then I was struggling to make a living. Somehow John Seigenthaler was aware of my efforts, and one day in the summer of 1972 when I was waiting tables down on Elliston Place at the Ritz Cafe, John, who was eating lunch there with several others, called me aside and offered me a part-time job as a copy editor at the Tennessean. I had recently written and sold two feature pieces to the Tennessean, but I don’t think that had anything to do with John’s momentary life-saving offer, which I gratefully accepted. I lasted less than a month on the rim, but produced what I have always thought was a dynamite headline — Smyrna Mayor Steers State Auto Group. However, because I was not adept in the math of making heads fit their space, my masterpiece broke and did not run. Nevertheless, even today I consider myself quite the clever headline-ist. A few years later I had two full-time jobs — one as an English instructor and another as a full-time Metropolitan Deputy Sheriff for Nashville and Davidson County. As an English instructor I was employed by the Dominicans who adored John, and as a deputy I worked for John’s boyhood friend, fellow Democrat and Irish Catholic, Nashville’s High Sheriff, “Fate” Thomas. I didn’t get hired by either of those two entities because of John; I mention him only to illustrate my claim that everything there was in fact linked in what might accurately seem an infinite number of hooks and eyes. Anyhow, there I was, flanked by two enormous archetypes: Working for Mother Superior one one hand and on the other . . . for Father “Fate”! The most direct reason I got the job as deputy was that Sheriff “Fate” Thomas decided he wanted to go to college to at least earn an associate’s degree, and he was my student. He often did not show up but would send one of his deputies to sit in class with a recorder and take notes. “Fate” performed remarkably well in Sophomore Lit. It was only later I discovered that everyone downtown in the Sheriff’s Office had had a role to play in writing “Fate’s” papers. But it was during that time that “Fate” told me he knew I needed extra employment and wondered if I would like to work for him as a deputy. “Will I have a badge?” I asked. I couldn’t wait to report for duty. I got the badge and was, like all my fellow deputies, forbidden to arrest anyone, ever, under any circumstances no matter what. That sort of enforcement was the job of the Nashville Police. As Sheriff’s deputies we did a thousand other things, and most of us, me included, only “went armed” when one or more of our county inmates escaped, which could mean they simply walked away with the visitors and went home. Whenever “an escape” happened, we deputies would “surround the house.” Bear in mind most of us were teachers, coaches, recently unemployed young people, and one of our number was the drummer in the band on Hee Haw. But in those days there in Nashville, if you were a Catholic or a Democrat — or even knew any Catholics and Democrats — you could be a deputy. And I was fortunate beyond words and in every direction. Suddenly it was 2005, twenty-four years after I was long gone from the days of those experiences I’ve described, and I found myself sitting with John in a studio at Nashville Public Television, taping a segment for his long-running program, A Word on Words. He was asking me about my first novel, Junior Ray, and saying wonderful things about the book, which was dubbed “hilariously tasteless” by Publishers Weekly and called, in the Mobile Press Register, “perhaps” the most profane literary work in recent history (both of those comments, I must add, were first-rate accolades). John, however, was the first of only a very few individuals who have taken notice of the non-profane parts of Junior Ray, specifically the poetry that makes up much of “The Notes of Leland Shaw.” I have to say, not as hyperbole but as fact, that if John Seigenthaler had been the only one who ever asked me anything at all about my book, that would have been sufficient for the rest of my life. “Well, if he is,” I said, “it’s the end of organized crime.” The humor was automatic and explosive, and I shall remember the exchange even if my brain should shrink to the size of a Chiclet. John Pritchard is the author of Junior Ray, The Yazoo Blues, and Sailing to Alluvium. He resides in Memphis, Tennessee. A new video and a podcast interview with attorney Fred Gray complement the release of the newly revised edition of Gray’s memoir, Bus Ride to Justice: Changing the System by the System. During the tumultuous years of the Civil Rights Movement, Gray served as the lawyer for Martin Luther King and Rosa Parks; he also argued in cases involving school desegregations, and helped bring about a presidential apology for victims of the Tuskegee Syphilis Study. A video of Gray’s September presentation at the Jimmy Carter Presidential Library and Museum is available online from C-SPAN2; an interview with Gray on John Seigenthaler’s Words on Words program can be downloaded as an MP3. At the Carter Library, Gray described his book to the audience as “a history of the Civil Rights Movement as it begun in Montgomery, Alabama, in December of 1955, spreading throughout the state, throughout the country.” He continued, “The effects [of the Civil Rights Movement] went around the world. Almost every civil rights event that has occurred since 1955 — to some degree — you can trace a great deal of it back to Montgomery, Alabama.” Gray’s memoir details these integral events in Montgomery, including the arrests of Claudette Colvin and Rosa Parks, and the Montgomery Bus Boycott. Gray’s speech aired on C-SPAN2’s Book TV and is available for viewing online. On John Seigenthaler’s Words on Words, originally aired on October 27 on Nashville Public Radio, Seigenthaler and Gray look at the revised edition of Bus Ride to Justice‘s new revelations about Rosa Parks’s arrest and the beginning of the Montgomery Bus Boycott. In the book, Gray reveals that he and Parks, a secretary for the Montgomery branch of the NAACP, spent many weeks discussing how to use an arrest as a way to push for change in Montgomery. John Seigenthaler’s C-SPAN2; an interview with Gray on John Seigenthaler’s Words on Words interview with Fred Gray, including a discussion of the photographs included in the book, is available as an audio podcast. 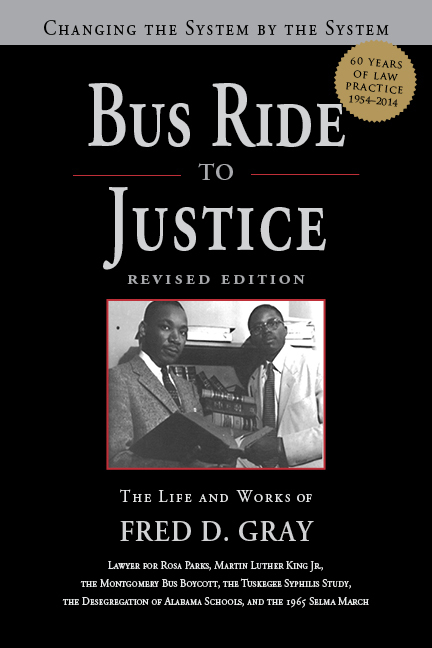 The revised edition of Bus Ride to Justice: Changing the System by the System by Fred Gray, is available as a hardcover and ebook from NewSouth Books, Amazon, or your favorite bookstore. You are currently browsing the archives for the John Seigenthaler category.